I'm not gonna lie: I enjoyed this week's RAW more than I actually expected I would. Why? Here's why: They finally addressed my whole thirst for a Dean Ambrose heel turn. If you've been following my reviews for a while now, you probably would have noticed how I won't shut the fringe up about a Dean Ambrose heel turn and for good reason. Well, for a good many reasons. First, Dean's return came with a new look: shorter hair, a beard, and a bulkier frame. This scary Dean who seemingly just got out of prison looked like a mighty promising heel. Second, remember the circumstances that led to Dean's injury in the first place? The lunatic held the unofficial title of WWE "iron man," having wrestled over 1,000 matches from 2012 to 2017 without suffering a major injury until the Shield was reformed. You know who else is considered the WWE's "iron man?" 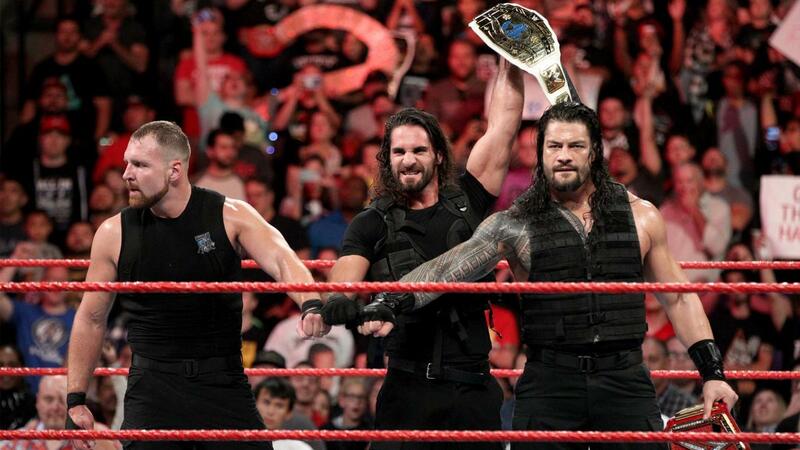 He's a member of the Shield and went on to become Intercontinental Champion while Dean was injured: Seth Rollins, the man who broke the Shield up in the first place. If that article featuring WWE Creative Jon Robinson is to be believed, then the endgame prior to Dean's injury was for Seth and Dean to bump heads. Now I know I probably sound like a conspiracy theorist nut job but that's exactly the point. This week's RAW was all about conspiracy theories, people finding themselves thinking about the grander scheme of things, if there even was a grander scheme of things in WWE. In one corner, you have Dean Ambrose, who definitely could make for a strong argument, and a lot of cheers, if he turns on The Shield at Super Show-Down. Dean's got just as much talent as Seth, maybe more than Roman, but he's the only Shield boy to be carrying zero titles at the moment. In the other corner, you have the Scottish Psychopath, Drew McIntyre, who had a pretty good run as a face on NXT. If he turns on Dolph Ziggler and Braun Strowman at Super Show-Down, he could join the Shield, turning it into a four-man faction and possibly going after the tag titles with Dean. With the recent turns and betrayals in the biggest wrestling promotion on the other side of WWE's world, either of these happening seems very appropriate. Then again, Drew is already tag champion with Ziggler and a Dean turn might still happen but probably not until at least Survivor Series, where the Shield will get to face another formidable team and yadda yadda yadda. Still, the possibilities teased by this RAW were pretty interesting, to say the least. Drew and Dean even talking things through with each other after Dolph and Seth played their respective devil's advocate arguments was a nice touch. With this brand new twist in this storyline feud, color me intrigued. Hopefully, this actually goes somewhere and doesn't just become another wasted opportunity. Both Dean and Drew are bankable wrestlers who deserve more than being bit players in Strowman versus Reigns chapter 453. Both men seemed like they knew that was true, too. Maybe another week of prodding should do? From botching suicide dives to concussing a rioter, Brie Bella's in-ring comeback is proving to be terrible, worse than her husband's according to The Miz. Why are the Bella Twins still on RAW anyway? Someone give them a ride back to SmackDown Live and leave them there for Liv Morgan's sake. There's a strong and oft-repeated argument in the idea that The Bella Twins are sabotaging the whole idea behind Evolution. We were done with taking a piss during women's matches and now they're bringing that back. They have been so counterproductive to the movement. Like, oh my god. The main contribution the Bellas had for the Women's Revolution was being so goddamn awful, the other women had to start the revolution. Individually, though, there's also a strong counterargument in Nikki Bella's solid 2014-2016 run. Brie Bella? Not so much. Between Nikki and Brie, there's a clear better Bella and no amount of using pregnancy and ring rust as an excuse can change that. It's hard to make excuses for her anymore, especially since we've seen her botch the same move in the same match and weeks later concuss another wrestler. Good luck to the remaining two members of the Riott Squad at Super Show-Down. Brie's third time's the charm could become third time's more harm. Speaking of the Women's Evolution, Ember Moon is now Nia Jax's back-up? Man, they really have nothing for Moon. As expected, Jax got the win here, even though both Mickie James and Alexa Bliss were in Foxy's corner at ringside. I guess the mean girls learned their lesson. Drew McIntyre. Dolph Ziggler. The Revival. That RAW Tag Team title match was amazing. There was no doubt in my mind it would be so, but damn, did that make me realize further how criminally underused and disrespected The Revival is. That tag team deserves more, to be honest, but its run on RAW has been so disappointing. Both Scott Dawson and Dash Wilder are very talented wrestlers and they were able to argue their case here. They even gave the champs a run for their money in this match and almost had it won, claimed ZigMc's gold. Alas, it wasn't meant to be. Back to the end of the line for NXT's former Top Guys, I suppose. The Kevin Owens Show is pretty awesome on its own. The Kevin Owens Show with Elias? Is this Conan with Max Weinberg? Jimmy Fallon with The Roots? David Letterman with that bald guy whose name I just forgot? This could actually work. Make it a standard part of RAW, Vince! That booster seat quip for Lio Rush was gold. I'm sorry, I know it's mean, making fun of a 205 Live guy's height, but this guy happens to be Lio Rush, who does all these great tricks despite his lack of height. Rush ain't getting besmirched with these jokes. Rush's speed, agility, and athleticism can speak for him, unlike Bobby Lashley who needs to borrow Rush's charisma. It's aight, though, since Rush is portrayed like he needs to borrow Lashley's power and protection. 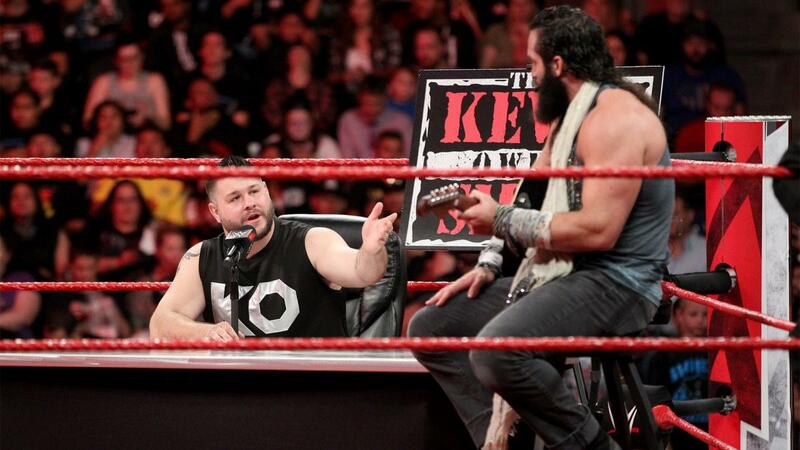 For the second RAW in a row, my best friend in the whole wide world Kevin Owens and Elias chased Rush all around the ring after Lashley lost yet again to Elias by DQ. They almost got him but Lashley made the save. Is Rush getting in that ring as Lashley's back-up against KO and Elias? Apparently not. That'll be John Cena's job for some reason at Super Show-Down. He's probably going to debut that weird finisher. Sigh. 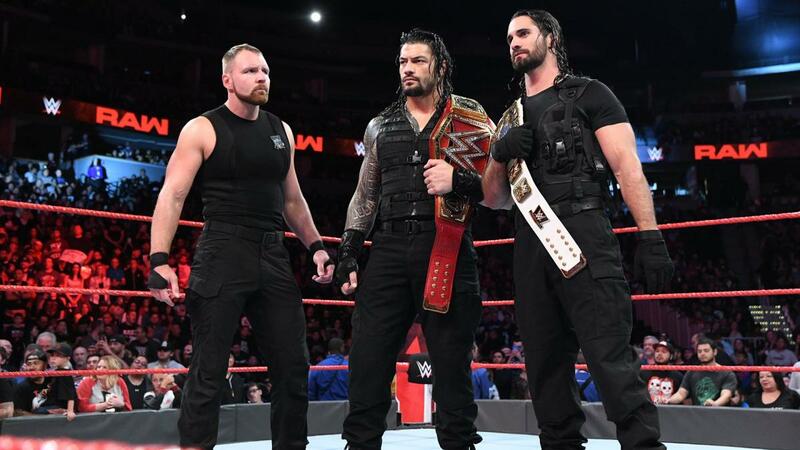 RAW REVIEW: Headlined by some intrigue this week, the feud between the Hounds of Justice and Dogs of War just got more interesting for me. This RAW offered us a preview of the two possibilities that could happen at Super Show-Down, though a part of me is still dubious that any one of them would even turn. Dean Ambrose turning on his Shield brothers? Or Drew McIntyre turning on Dolph Ziggler? Glad to see The Revival show the world what they've got, but sad to know that this defeat might mean they'll get shipped to the backburner just because Creative doesn't have anything for these two talented tag team specialists. Also sad that RAW Women's Champion Ronda Rousey wasn't around this week and mostly baffled at the Bella Twins still being awful at what they do. I'm giving this week's RAW a C for "Can someone please just drive the Bella Twins far away from RAW?" Oh, and happy birthday, Steph. Stephanie McMahon was back on RAW alongside husband Triple H and she's as venomous as ever. Thanks for the birthday greetings, Acting RAW GM Baron Corbin. As a show of gratitude, let Steph chew you out for doing someone a McMahon, while Triple H himself booked you in a match against The Shield with two partners of your choosing. Basically? Git gud or Kurt Angle returns. Kurt Angle probably popped in his living room at that point. I'm not sure how to feel about this special Pediatric Cancer Awareness Month segment. On one hand, this was nice. The WWE, in partnership with Hyundai, made more people more aware of pediatric cancer and its survivors. 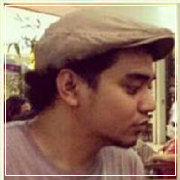 On the other? How is Braun Strowman just calmly standing so close to The Shield? Thankfully, Strowman didn't put those kids through that Hyundai. We all know he would've wanted to. With Mixed Match Challenge partner Bayley in his corner, Finn the Human Bálor beat Jinder Mahal, who also had his MMC partner, Alicia Fox, plus loyal henchman Sunil Singh at ringside. People have wanted this Finn/Bayley partnership since the first show, but it's surprising how well Jinder and Alicia work together. Jinder's post-match tantrum was very Foxy, although a bit cringe-y. I appreciated seeing Finn Bálor doing something again, even if it's a Mixed Match Challenge teaser. To be fair, this second season seems way better than the first, mostly because that match between the Phenomenal Flair and Day One Glow had everyone tussle with each other regardless of gender. Okay, so Konnor faced Chad Gable, not Bobby Roode. My bad. But I was right when I said Konnor was coming out on top this week. This feud is not ending anytime soon. Gable and Roode are still cool with each other, though the question remains: What Would Bobby Roode Do? Roode would kick the crap out of Gable and take that spotlight for himself, that's what. AOP joined Baron Corbin's team against The Shield in the main event and I laughed so hard at 205 Live GM Drake Maverick still wearing their gear at ringside. The Dogs of War bringing out steel chairs, only to use them for sitting down instead of killing anyone, was a great attempt at mind games. Maverick distracting the referee to get his team an advantage makes him a heel, right? I mean, this was him directly being a turd, so he's definitely a turd on RAW now. It's interesting how Ambrose did most of the work in this match, but Reigns picked up the win anyway. Dean might've chosen his "brothers" this week, but come Super Show-Down, that might very well change. Triple H had pretty great rebuttals to The Undertaker's claims from last week. They were brief and to the point, though the ship has sailed for the Undertaker's end. Stoked for Shawn Michaels coming back to RAW next week, hopefully to hit the Sweet Chin Music on Baron Corbin.